Come one, come all to the grisliest show on earth! 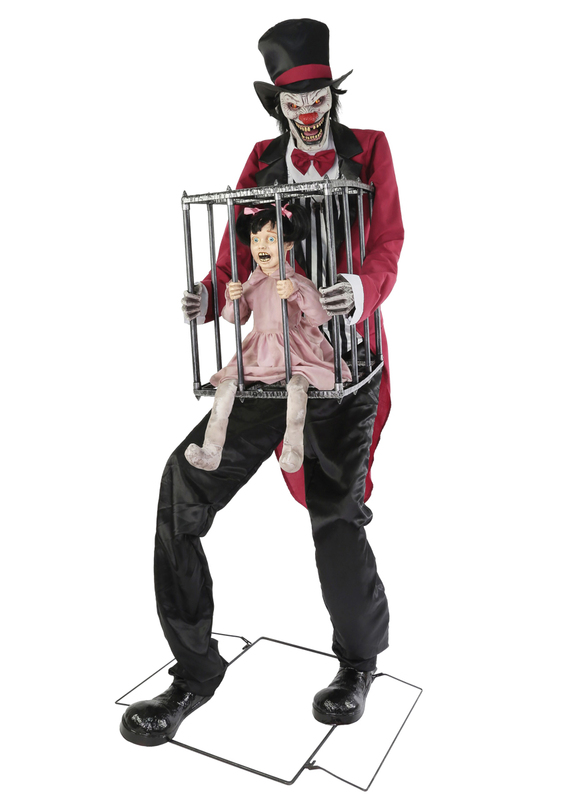 This 7-foot tall animated towering Ringmaster holding a large cage with a hysterically-screaming small child inside is sure to bring a carn-evil of terror to your house or big top! Plug the UL power adapter into any standard outlet and choose from Steady-On, Infra-Red Sensor or Step Here Pad (included) activation options to operate. Once activated, The ringmaster's eyes will glow with otherworldly glee and his head and torso turns side-to-side while he says one of 6 terrifying sayings! The infra-red sensor works up to 6.5 feet away and works in all lighting conditions - bright light to no light! Item includes volume control. Easy-to-assemble quick-connect poles. Assembly required. Materials: 70% Iron, 6% Electronics, 10% Cotton, 5% PVC, 5% PE, 2% ABS, 2% Polyester fiber. Indoor or covered-porch use only. Includes Step Here activation pad.